using the Site to obtain Products from us. All local area orders over $180 are free from delivery costs. For orders under $180, we will apply a flat $20 delivery fee. Areas we deliver to (subject to demand - call us, if in doubt). Further afield, with a minimum spend of only $280.00 Dicky Beach Family Meats provides FREE delivery to the Sunshine Coast and Northern Suburbs of Brisbane. Tuesdays and Fridays are our main delivery days. If you contact us 2 business days in advance we may be able to wavier our minimum spend on deliveries if your location matches in with our existing delivery run. 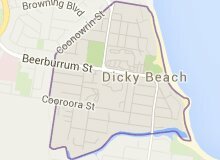 Delivery areas include the local Dicky Beach area through to Caloundra, and Northern Brisbane. We only supply and deliver the freshest meat possible, so we put your order together the day of delivery. As long as you place and pay for your order before 3pm, it will be ready for you to pick up by 10am the next day. If you need your order sooner, please call us to discuss. We will place all your items in bags (and styrophone boxes, for larger orders) and keep them in our coolroom until you arrive to pick it up. If you have a specific time that you need to pick up, or if you're going to be more than one day before picking up your order, please let us know via a phonecall or email after the check-out process. Please note that once the order has been paid for, the goods purchased legally belong to you, even though they will remain on our premises until such time as you pick them up. All orders must be picked up within 48 hours of the order being placed. As per our policy for selling only the freshest, highest quality meat, we will need to dispose of any unclaimed goods after 48 hours. We cannot give refunds in this instance. You may order goods by selecting and submitting your order through the Site in accordance with these terms and conditions. Any order placed through this Site is an offer by you to purchase the particular goods for the price notified (including the delivery and other charges and taxes) at the time you place the order. You agree to provide us with current, complete and accurate details when asked to do so by the Site. Failure to do so may result in termination of your account. You acknowledge that we are not required or obliged to match any prices for any Products, including matching any prices for a Product that is available through another Site. Prices for Products change from time to time and we do not provide any notice of these changes. Once we have accepted your order, we will not change any prices that apply to the Products in that order. You may cancel an order you have placed, provided you do so before 3pm the day the delivery is scheduled (currently Tuesdays and Fridays). You must cancel your order by calling the shop number. We cannot be held responsible for orders cancelled online without a notification phone call to us. Provided your order was for goods normally held in our shop inventory, you will not incur a cancellation fee, and you will receive a refund for payments processed. In this instance, please allow up to 7 business days for the funds to be transferred back to your bank account. For goods ordered that we have specially ordered in and/or processed, we cannot give a refund. We will normally advise you beforehand if your order cannot be cancelled. We have processes in place to assist in detecting transactions that may be illegal or in breach of these terms. We may contact you by telephone or email to confirm your payment and information details. If we are unable to confirm these details, we may cancel your order. if we are not able to supply to you the Product that you have selected. We aim to select substitute Products that are of similar value and quality, however we reserve the right not to provide you with a substitute Product even if a suitable substitute Product is available. If there are items missing from your delivery or collection, then you should check the receipt that we provided to you to determine if the missing Product is marked as out of stock. If so, then we will provide you with a refund to your card of purchase for the Products that were not supplied. arrange for a re-delivery of the missing item at an agreed time. should check the labels on the Products before consumption or use. you have and will comply with all relevant laws relating to your use of the Site and your placement of any order to us. must not frame or embed in another website any of the material appearing on this Site without our prior written consent. print hard copies of the content and Materials for the sole purpose of viewing and purchasing Products but not for any other use, including commercial use.